Continuing the pilgrimage of Our Lady in Her Icon of the Virgin of Czestochowa in Ecuador, the parish of Jesus the Good Shepherd received Her with great joy. The Conventual Franciscans are the shepherds of this parish. The Icon of Czestochowa that travels the world “From Ocean to Ocean” remained for eight days in the Primate´s Cathedral of Quito. 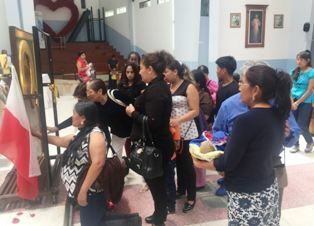 The parishioners visiting the temple, the most important church in Ecuador, displayed a lot of interest, curiosity and admiration for the Icon. Fr. Leon Juchniewicz, custodian of the Pilgrim Icon in Ecuador, and Fr. 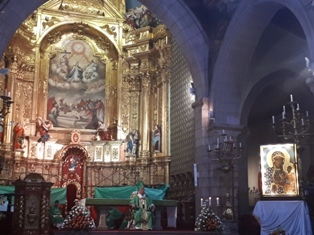 Bartolomeo Marciniak OSPPE, of the Monastic Order of St. Paul the Hermit who was visiting the country, brought` the Icon of Our Lady of Czestochowa to the capital, Quito. The road from Santo Domingo to Quito is approximately two hours. After completing Her journey through most of the parishes of the Diocese of Santo Domingo, the Pilgrim Virgin of Czestochowa in Her Icon said goodbye to the city that hosted Her for 10 months. 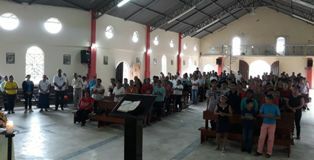 From November 23 to December 8, the Icon of Our Lady of Czestochowa visited the parish of Santa Martha, in the diocese of Santo Domingo, in the urban area in the center of the city of Santo Domingo. On November 9, 2017, in the framework of the jubilee celebration of the 130 years of uninterrupted evangelization in the Apostolic Vicariate of Puyo, the bishops of Ecuador with the new nuncio, Mons. Andres Carrascosa Coso, held the No. 143 Plenary Assembly of the Ecuadorian Episcopate. In his parish the Queen of Heaven the town of Monterey, Father Leonel Caselles received the Icon of Our Lady of Czestochowa on October 1 to the 3rd. She came accompanied by the Cross of Evangelization. This was a double surprise for the faithful.